OK, this one is a quick and easy recipe. I mentioned in my Bo Nhung Dam (Vietnamese Beef Dipped in Vinegar) and Bo Nuong La Lot (Vietnamese Grilled Beef with Wild Betel Leaf) that they're dipped with mam nem (Vietnamese fermented anchovy dipping sauce). If you think nuoc mam (Vietnamese fish sauce) is pungent, then this stuff will positively reek. But man! Is it good! :P While both sauces are made from fermented anchovies, regular nuoc mam is strained until only the salty liquid is left. Mam nem uses the whole fish. Optional: chili peppers, lime juice, garlic, sugar. I use my mom's quick and easy method. 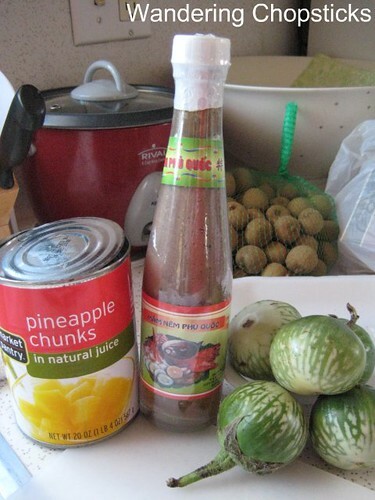 One bottle of mam nem (Vietnamese fermented anchovy sauce) and one can of pineapples, drained of liquid. Puree. Then doctor it up with chili, garlic, lime juice, or sugar to your taste. That's it. Ideally, fresh pineapples would be best but canned works fine in a jiffy. Add some of the reserved pineapple juice or sugar if the sauce is too salty. 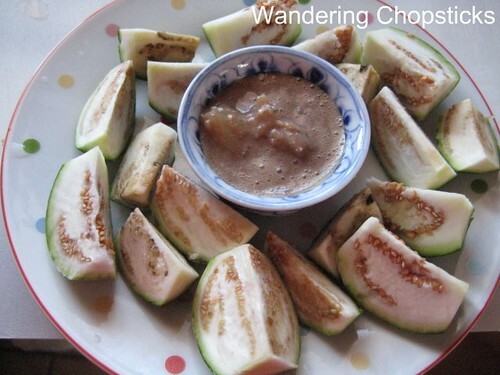 One of my simple pleasures is cutting up slices of Thai eggplants and dipping them in the sauce. I have fond memories of one summer when my ba noi (paternal grandmother) grew 17 Thai eggplants. She was so proud of them and even had my uncle film them so she could show it to relatives in Vietnam. She wanted me to exclaim on camera, "Wow! Ba noi, how did you grow such beautiful eggplants?" But alas, I'm not that much of a ham. Now I wish I had done it. Only because it was such a simple request that would have given her such pleasure. 1 year ago today, overly salty dishes at Roy's - Newport Beach, and a little primer on che at Thach Che Hien Khanh - Westminster (Little Saigon). Yes! Me! I love mam rouc, especially with green fruit of any kind - mango, peaches, guava. Hey WC - Is this the stuff they put in Bun Mam that makes it so delici-yoso? 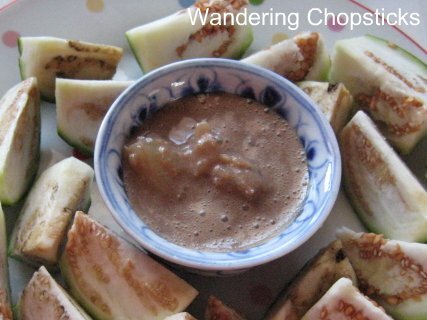 Did you see my fruit salad with mam ruoc and tamarind recipe? Good stuff! Yes, it is. Lots of it. But also bun mam also uses large fish that have been fermented and not just little anchovies so that's why it's so intense. Bagoong is closer in flavor to mam ruoc since they're both shrimp pastes. It sounds weird but the fruit salad hit all my sour, spicy, salty notes. Come on WC you can make mam nem from scratch! ;-) Making it fresh beats anything from a bottle....fresh geesh the irony. Yes I do....I love stinky sauce but prefer to make it from scratch. I'll keep my sau rieng smell and you can keep your mam nem smell. haha. I do not like mam nem or mam ruoc AT ALL. In Malaysia there is one particular state (i.e., State of Kelantan) which is famous for something similar to Mam Nem. The sauce is called 'Budu' and we used as dipping for vegetable such as boiled eggplant. The sauce is prepared by adding sliced hot chili, and lime juice. Malaysian and VNese shrimp pastes are a bit similar too. And you can add chili peppers and lime juice to both as well. Does anyone know if you can grow Thai eggplant in MN? Anyone? Umm, I'm just one person. Why don't you buy a plant and see? Aww. That's nice to hear. I'd love to know if mam nem should be refrigerated too. 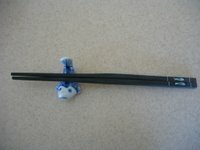 It's got such a strong smell and flavor, I'm not sure I'd know if it went off or not! :) I use small amounts when I want a stronger flavor of nuoc mam but adding more would make it too salty. So glad I found your blog. I'm white but, in my opinion, Vietnamese foods are the best in the world! We have a wonderful small Vietnamese grocery in a nearby town. I love shopping there - they know me well and they're super-friendly. They'll even grate fresh green papaya for me if there's none on the shelf. Lots of different greens that I'm not sure how to use but I'll look through your recipes to learn how to use them. I think they even carry wild betel leaves too! I hadn't known till I read your recipe using them that they're entirely different from the kind that's chewed by old folks in Asia. Once opened, it should go in the fridge. Definitely if you've mixed it with crushed pineapples. But then it should last for months and months. I don't know if it can go off since it's already fermented? Don't quote me on that though! :P But yeah, I keep mine in the fridge and haven't had any problems. I've been meaning to write a guide to Vietnamese herbs. I've been meaning to do a lot of things! Never enough time!